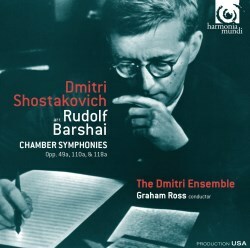 In an informative note accompanying these recordings Marina Frolova-Walker relates that Rudolf Barshai was a pupil of Shostakovich and that he founded the Moscow Chamber Orchestra in 1955, remaining as their conductor until 1977 when he emigrated to the West. It was for that orchestra that Barshai made these three string orchestra versions of Shostakovich string quartets – and of the Third and Fourth Quartets also – all of them with the approval of the composer. That Barshai was closely attuned to Shostakovich’s music is confirmed by his notable recorded cycle of the complete symphonies (review). One other thing to factor in is that Barshai had significant experience as a string quartet player early in his career. In 1945 he was the founding violist of the Moscow Conservatoire Quartet, which in 1955 changed its name to the Borodin Quartet. By then Barshai was no longer part of the ensemble; he left it in 1953. The Borodins became closely associated with Shostakovich’s quartets, though it was the Beethoven Quartet that premièred almost all of them. Whether that association with Shostakovich’s works in the genre began while Barshai was still a member of the group I don’t know: only the first five had been written by the time Barshai left the quartet. However, that matters little; what is much more important is that Barshai brought to his work on the five quartets that he arranged a deep knowledge of Shostakovich’s music and significant experience as both a string quartet member and as a conductor of a crack chamber ensemble. Marina Frolova-Walker avers that Barshai “was much more than a deft orchestrator; he would take risks in his attempt to enter the composer’s mind, imagining how ideas would have been conceived for a different medium.” As we shall see, one such example of his risk-taking occurs in his arrangement of the First Quartet. A word about the forces involved may be in order. The Dmitri Ensemble list 23 string players in the booklet and I assume, since we’re not told otherwise, that all the players took part in all three performances. The Eighth Quartet (1960) was the first quartet that Barshai arranged for a larger ensemble and the composer’s approval is apparent from the fact that he bestowed on it the catalogue number Op 110a, a significant compliment. This deeply personal utterance was composed during a visit that Shostakovich paid to Dresden in 1960 when he was deeply moved by the still-evident ravages of the war-time bombings. He wrote it in just three days so it was clearly a visceral response to what he saw around him. Much of the music is harrowing in its intensity and it’s shot through with the composer’s personal DSCH motto. In the opening Largo, paced most convincingly by Graham Ross, Shostakovich’s spare music is tautly controlled by him and his players. The five movements play without a break so we’re then plunged headlong into the fierce, driven Allegro molto. The complete unanimity between the players is as great as one would hope to hear from just four musicians. There’s admirably pointed playing in the sardonic waltz movement that follows. In the gripping, tragic second Largo the “rat-tat-tat” chords have great power and depth every time they appear though some listeners may hanker after the bald sound that a quartet would supply here. As this intense elegy unfolds I admired the very firm bass sound from the ensemble. It’s noticeable too that there’s refinement as well as intensity in the way that The Dmitri Ensemble voices this draining music. The concluding movement, yet again marked Largo, is expansive and moving in the hands of Ross and his team. This is a very fine performance indeed of the Chamber Symphony. The First Quartet dates from 1938 and Barshai arranged it in 1995. I think it was extremely shrewd planning to place this music on the disc between the two intense, confessional pieces that frame it for its lighter tone offers the listener some emotional respite. The Quartet is described, aptly, in the notes as a “graceful and serene essay” in which Shostakovich tested the waters of the quartet medium. The score has Classical proportions and a Classical feel to it. So, much of the first movement – though not all of it – is elegant and relaxed. The second movement is a set of variations on a theme that it announced by a lone viola – rightly, Barshai left this passage as it was in the original version and did not have the theme played in unison by the viola section. It’s in this movement that Barshai takes his risk, introducing a celesta into the instrumental palette (track 7, 2:10). Purists may object but I think it’s an inspired idea. The unorthodox and unexpected extra timbre works really well. The effect is charming – not a word one would use all that often in connection with Shostakovich’s music, to be honest. The third movement, marvellously played here, is a light-footed scherzo interspersed with graceful episodes. The Dmitri Ensemble, though far larger that a quartet, never sound excessively heavy here. The finale is energetic and mainly good natured; it receives a spirited performance here. The Tenth Quartet, composed in 1964 and arranged by Barshai in 1968 as ‘Symphonie für Streicher’, is an ambiguous score. The first movement is quite understated and I’m unsure what exactly the composer was seeking to convey. There follows an Allegretto furioso which has great weight and energy in this reading; the rhythms are tautly articulated. The slow movement takes the form of a passacaglia, a favourite compositional device of Shostakovich. In this eloquent performance I admired the way in which the various sections of the ensemble are scrupulously balanced and blended. Finally we hear an Allegretto which is easily the longest movement in the work. The tone is deceptively light at first but the composer gradually racks up the intensity and the emotional peak is reached in a turbulent central section. Thereafter the music subsides but you have the sense that it has subsided into a calm which is at best uneasy. Shostakovich’s music and Rudolf Barshai’s very understanding re-imagining of it is expertly served in these superb performances, both in the technical sense and emotionally. There will be those, I’m sure, who will argue that these arrangements undermine the essential intimacy and the conversational element that’s the essence of string quartet writing and performance. I understand that point of view completely but Shostakovich gave these arrangements his blessing and they serve to bring this eloquent music to a wider and perhaps different audience. The arrangements add an extra dimension to the music. Graham Ross and his expert colleagues make a wonderful case for these works and their outstanding performances have been captured in very fine recorded sound, produced and engineered by John Rutter. I hope that this very fine disc will be followed by recordings of Barshai’s arrangements of the Third and Fourth Quartets.